2018 Call for New Partners! 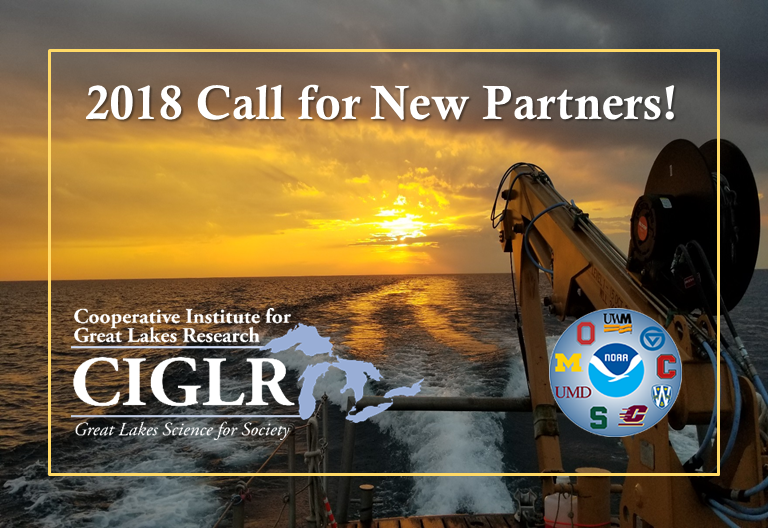 CIGLR seeks proposals for new members to join our Regional Consortium, which serves to expand our research expertise and capacity across the Great Lakes. Successful applicants will join the nine research universities, three non-governmental organizations, and three businesses currently partnering with CIGLR in cutting-edge research and a suite of programs that aim to build collaborative partnerships through career development opportunities, visionary science, and impactful outreach. As one of 16 NOAA-funded Cooperative Institutes across the United States, CIGLR engages Regional Consortium partners in research and development activities that support NOAA’s mission to lead applied research involving the nation’s weather, oceans, and coastal resources. CIGLR’s Regional Consortium spans all five Great Lakes and both sides of the U.S.‒Canada border. CIGLR also operates a Research Institute that complements NOAA’s workforce with a highly-skilled, permanent group of research scientists, postdoctoral fellows, technicians, and staff that are collocated with our sponsor, the NOAA Great Lakes Environmental Research Lab (GLERL) in Ann Arbor, Michigan. CIGLR is hosted by the School for Environment and Sustainability (SEAS) at the University of Michigan. Interested institutions and organizations can find more information on the benefits, terms, and proposal requirements in the full call for proposals, linked below. Contact CIGLR Director Dr. Brad Cardinale with questions (bradcard@umich.edu or 734-764-9689).